Hello, friends, and welcome to the very first episode of The Greg Amundson Show. Many years ago, one of my dear friends, a mentor of mine, said these words to me. He said, “Greg, if you tell me the truth, I will believe you. If you tell me a fact, I will listen. 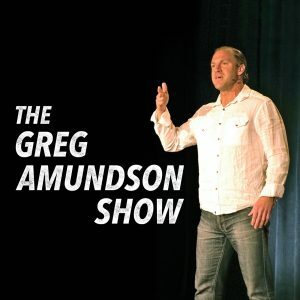 However, if you share with me a story, then I will remember.” My goal with The Greg Amundson Show is to share with you a series of stories. Here’s the exciting part about using storytelling as a means to transfer a message. Storytelling allows you to not only remember the lessons that I’m so desirous and excited to share with you; perhaps most important, storytelling allows you a context to understand and ultimately apply these lessons in your life. Now, I got to begin by saying that The Greg Amundson Show was not my idea. I’ve been blessed with having an opportunity to be on many, many podcasts, and following each of the podcasts that I’ve been on, the host would look at me and say, “You know, Greg, you should really have your own podcast.” And after so many of these recommendations and after so much encouragement from the dear mentors and the leaders in my life, I decided to go ahead and start this year with this show. Let’s begin. I want to go back in time and share with you one of the stories that comes from my life. The reason this story is so important is it has to do with two of the greatest role models, two of the greatest leaders, two of the most influential people in my life, and those two people are my mom and dad. Sadly, both my mom and dad have passed away. However, even to this day, I feel their presence in my life. As a matter fact, I joke a lot of times with my three younger brothers Mark, Stephen and Erik, that one of the books I just got to write during my lifetime is going to be called Dear Mom and Dad, You Were Totally Right, and then outline all the amazing lessons that they taught me. So let me share with you two of the amazing moments in my life in which my parents gifted me with an absolutely profound piece of wisdom. When my dad was nearing the end of his life, he was at Dameron Hospital in Stockton, California. I went to visit him because my mom called me and said, “You know, Greg, he doesn’t have much time left.” I was living in Santa Cruz at the time, so I immediately dropped what I was doing and I drove from Santa Cruz to my hometown of Stockton, California. I drove right to Dameron, I went upstairs to the third floor of that hospital room, and went into my dad’s room. My mom left so that I could have some private time with my dad. At this time in my life, I was brand-new into the law enforcement profession, so the motivation for moving in the direction of law enforcement at that time had a great deal to do with pride. I had pride in my department. I had pride in the profession of law enforcement. Pride was my motivating influence at that time. So, of course, I went up to my dad and looked at my dad and I said, “Dad, I’m going to make you proud of me.” As I whispered that to him his eyes were closed, he was laying on his hospital bed, and a little smile crept on his face, he opened his eyes, and turned his head to look at me, and through a strained voice, here’s what he said. He said, “Greg whatever you do, do it for love.” Wow! Talk about a life-changing moment. Whatever I do, do it for love. And from that moment forward, the direction of my life changed, and I realized I had much more intrinsic power in everything that I did because love is the ultimate source of creation. And if I was able to bring love to all of the ideas and the goals that I had, well, I had the power of God moving through my life. And to this day, love is the motivating factor for everything that I do and I owe it all to that moment in time and the words of my dad. Ten years later, sadly, there I am with my mom ironically back at Dameron Hospital. She is now approaching the end of her life from a very similar illness. She was in a coma that she would periodically come in and out of. As I sat next to her that day, she came out her come which she’d been in for several days, and she looked at me and we started to converse. And for several minutes of our conversation she just wasn’t really making sense, although I was nodding and trying to maintain the conversation as long as I could. And then finally, she paused for a moment as if she was gaining some inspired wisdom, as if God was speaking right through her. She looked at me and she said, “You know, Greg, everybody can encourage somebody and be supported at the same time.” Wow! Now to this day I’m still trying to unravel all the layers of wisdom and knowledge and guidance that my mom gifted me in that simple statement. But let me share with you what’s currently on my heart: the idea that everybody can encourage somebody. We can all be a source of encouragement to another person. And what’s the greatest source, what’s the greatest means? What’s the tool that we have at our disposal for encouragement? Well, so often, it’s the words that we speak, it’s our spoken language, it’s the way that we converse and communicate with other people. Well, sometimes, the person that we need to encourage the most is in fact us. And how do we communicate with ourselves? What’s the best means we have to motivate, encourage and support our own dreams and goals? Well, once again, it’s the power of our spoken word, and what’s so amazing to be considered about our spoken word is what precedes the spoken word is our thinking, the quality of our thoughts. What we’re contemplating in the temple of our mind is ultimately responsible for everything that we say. We can be a source of encouragement to ourselves and other people by our spoken word. And then this notion of not only encouragement but support. We need support in our life. We need support from other people. However, we need support from a permanent function, from a permanent factor, from a rock, from a solid foundation that is not subject to change. Even our most loved ones, even the most cherished human relationships are subject to change. So if we base our support on something that’s subject to change and it changes, our system of support and our foundation might collapse. However, if we base our support on God, on the word of God, then we’re building our foundation on something that is changeless, something that is the same today, tomorrow and forevermore. So in this series that I’ll be sharing with you, so often the wisdom that we are learning through the story will be substantiated and based on the word of God. So right away, as we begin this series, I want to go right to one of the most profound stories in the Bible. The reason I’m starting with this particular story from the Bible is that the first season of The Greg Amundson Show is going to be subtitled The Power of Your Mind. The entire season is dedicated to investigating how much power we have right here between our ears in the temple of our mind. So I want to share with you what I think is one of the most interesting and compelling stories from the Bible, and of course, it has to do with the greatest teacher who has ever lived, Jesus Christ. When Jesus was with his apostles, traveling and teaching and ministering, simultaneously as people were flocking to him for inspiration and education, other people were coming to him in an attempt to set him up and bring the law against him. These were people who wanted nothing more than to unravel and to dismiss the great word and the great ministry of Christ. Wow! Every time I think about that story or read that story from the Bible or share that story, I just get more and more excited, more and more pumped, more and more stoked about the message and the layers of message in that story because at the time this was a radical notion. Everyone was so focused on these laws and these customs and these traditions and Christ said, “Enough!” Enough! Let’s start to consider the power of the spoken word. It’s what comes out of your mouth that defiles you. Or put in the positive tense, it’s what comes out of your mouth that allows you to create the life of your dreams. It’s what comes out of your mouth that allows you to bring your life experience into perfect alignment with the experience of life that God is desirous for you to have. It’s a power that we have all had for the longest time. Yet, we may not have considered it. Perhaps because just like those people that meant to accuse Christ, we’ve been more concerned with what we’re putting into our mouth, more concerned with the tactile and the physical nutrition that we’re consuming, yet perhaps forgetting about the real nutrition of our soul, the nutrition of our spirit, and that, my friends, is our spoken word. Yet, as I already mentioned earlier, what precedes the spoken word? Our thinking. Our thoughts always precede everything that we say. And as we bring more and more awareness to the quality of our thinking, then we begin to speak with the precision, with the beauty and with a power that allows us to ultimately achieve any goal that God puts on our heart. It allows us to communicate with the Creator of the world. The Bible says that, “When my word resides in you, then anything that you’re desirous of and anything that you ask for will be yours.” [John 15:7] It also says, “In the beginning was the word and the word was with God and the word was God.” [John 1:1] And God gave us the ability to speak. When we align our speaking with the voice of God, it’s in those moments, my friends, that we are in his presence in a way that we can only begin to understand and imagine. As you can probably tell, I am so fired up. I’m so motivated to share this message and this is only Season 1. As we move into further seasons on the show I’ve got some great surprises in store for you. Yet, it’s always a matter of returning to the foundation, and we lay our foundation, my friends, in Season 1 as we begin to really investigate and dig into the power of our mind and the power of our spoken word. Until then, my friends, may God bless you and keep you safe, and I will see you back here very soon as we begin Season 1 of The Greg Amundson Show.